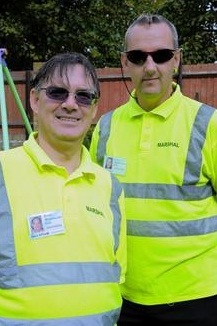 THE EVENT MARSHALING UNIT OR "EMU'S" ARE A VOLUNTARY ORGANISATION PROVIDING MARSHALS FOR ALL KINDS OF EVENTS. SOME OF THE EMU'S IN FULL POSE MODE AT DOVER CARNIVAL. The "EMU'S" were first founded to provide local event cover, over the years our reputation has grown along with the unit and we now provide marshals to many kinds of different event from carnivals to charity bike rides, and torch light parades to bonfire nights. NO'S 1 + 2 RESPECTIVELY.